“Road Closed! Slide Ahead.” We knew this already—thats why we drove to Big Sur in the first place. Liam “Red” Taylor, our local guide, jumped out and started moving the signs so we could drive through. We were certain that what we were doing was not the most legal. Public safety has become more important than the personal freedom to risk injury. As an oversized CalTrans truck came around the last bend, we thought we were busted before we even got a chance to do what we came for. Maybe it was the joint Liam and the kids smoked earlier at camp or the strong sense of community a person gets growing up in a small town, but our guide calmly smiled and waved the truck through. Ten minutes later we were at the top of a long down sloping portion of HWY 1, totally alone, unpacking our skates, and looking out over the ocean while high-fiving our dumb luck. 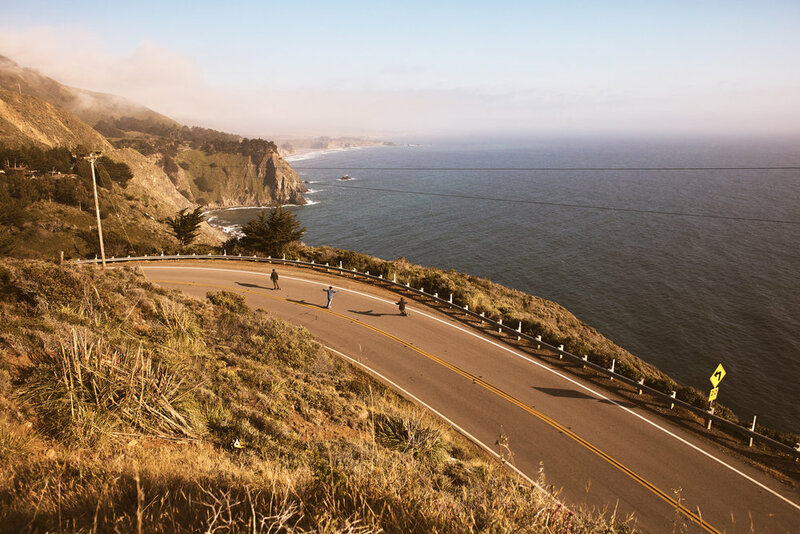 We swooped around the empty turns overlooking the Pacific as vultures circled overhead. We ducked under branches of Monterrey Cypress trees and dared each other to make each run faster than the last. Just a few months ago, the first portion of PCH in Big Sur was bumper to bumper with cars full of German tourists blasting The Beach Boys. Skateboarding this infamous stretch of asphalt would have been impossible and ridiculously dangerous. That day, thanks to landslides and some light trespassing, we had the place to ourselves. We were free to carve the whole road if we wished to relax or bomb straight down if the need for adrenaline kicked in. It was paradise. Back at camp, under a sky full of stars that hide from the bright lights of Los Angeles, we reminisced over slightly undercooked chicken from the comfort of our hammocks. We drank cold beers and decided that Daniel was the standout. He showed no regard for his personal safety and earned many pats on the back. We agreed that our guide, Liam, skated with the most grace, carving the road with a relaxed style akin to the surfer Gerry Lopez. Some days are easy to forget, full of work, bills, and stress. This day of skateboarding, free to ride the coast of Big Sur by ourselves, was one to remember.